Tourism Management, Third Edition, builds upon the strength of the previous editions by introducing students to the complexities of the tourism system. The third edition has been updated with recent industry and research developments and retains the thoroughness of content and application that had been established in the previous editions. A theme of this edition is looking at the challenges of tourism in a time of regional and international uncertainties and complexities as a consequence of terrorism and security threats, health issues such as SARS, natural events like the Boxing Day Tsunami and the changing geo-political landscape. David Weaver is Emeritus Professor at the University of Missouri-Columbia and a Specialist in Cattle Health and Production. 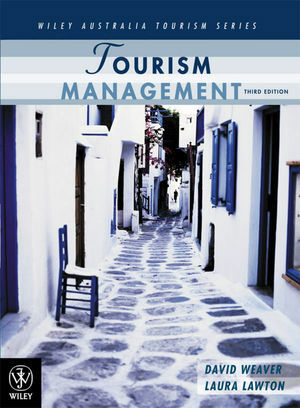 Chapter 1 Introduction to Tourism Management. Chapter 2 The Tourism System. Chapter 3 The Evolution and Growth of Tourism. Chapter 5 The Tourism Product. Chapter 8 Economic Impacts of Tourism. Chapter 9 Sociocultural and Environmental Impacts of Tourism. Appendix 1 Selected International and Australian Tourism Organisations. Appendix 2 Refereed English Language Tourism Journals (2005). Appendix 3 Inbound and Outbound Tourism Data. New case studies in all chapters illustrate the themes presented in the chapters. These case studies present real-life experiences; examples include the issues of sustainability with environmentally sensitive tourist regions, emerging tourist markets like China and the ability of tourist systems to respond to crisis and disasters like experience with the Indonesian tsunami of 2004.